In 2016, Star Warz keeps profiling itself as one of the finest Drum ‘n’ Bass concepts out there. Last edition, Star Warz presents ‘Critical Music’, was completely off the chain. In over 15 years of existence, Star Warz has been hosted by all leading and upcoming artists & labels in the Drum’n’bass scene and it also one of the partners of Tomorrowland since day one. For this edition, they are teaming up with another leading player in the Drum ‘n’ Bass scene namely Outlook Festival. Outlook Festival is Europe’s largest Drum ‘n’ Bass & Dubstep festival, held in Fort Punta Christo by the coast in Croatia. A true bass fest like Star Warz is! Both Outlook and Star Warz are honoured to welcome the baddest Drumn’bass label on the planet, Metalheadz, for their joint-venture in one of the most beautiful party venues in Belgium, the Vooruit. Get warmed up for a 'summer festival feeling' and get a glimpse of what you could also be experiencing from August 31st till September 4th in Croatia. 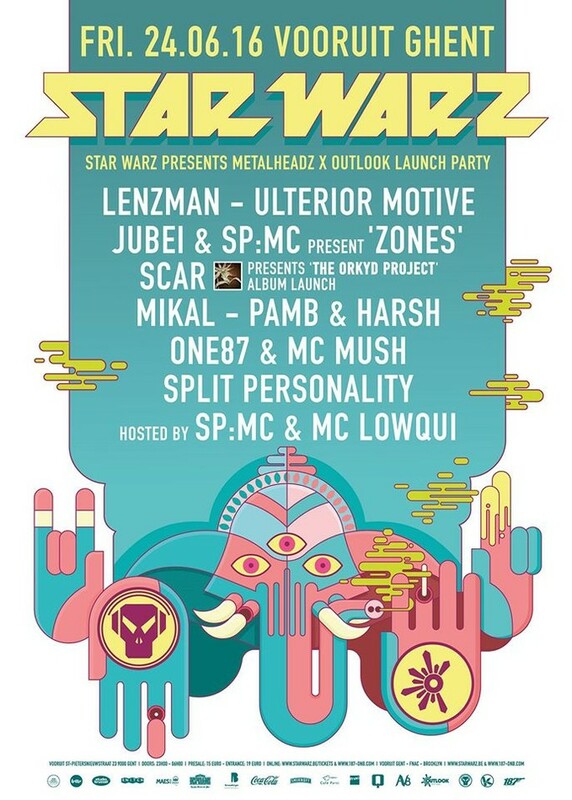 Star Warz and Outlook will be presenting the album launch of SCAR’s ‘The Orkyd Project’ album which will be released soon on Metalheadz. SCAR is made up of Survival & Script. Surivil has a formidable back catalogue, with regular releases on Dispatch, Symmetry, Critical, Exit, Shogun, DNAudio & Quarantine. He also generated a spate of brilliant releases with Silent Witness, Alix Perez, Octane & DLR for his own label, Audio Tactics. Script has a back catalogue including releases with Dispatch, Critical, CIA, Mute8 & Footprints and has worked with the likes of DLR Zero T, FD & Crystl. Friends for many years with similar tastes in music, their paths began to cross regularly so in 2013 they decided to collaborate on a tune. Born out of that first session was a piece of music called 'When' which was requested by Metalheadz to appear on the Platinum Breakz 4 album. Since their first release on that seminal album SCAR have gone on to release regularly to high acclaim on Dispatch, Metalheadz, Integral & Horizons. With their most recent releases the 'Caged EP' and the remix of Goldie's Rufige Kru 'Dark Rider' plus their debut album 'The Orkyd Project', all on Metalheadz as well as several other tracks scheduled for release this year and into 2017, SCAR and their instantly recognizable production sound are most definitely ones to watch for the forseeable future. Ulterior Motive are also at the top of their game. Their debut album ‘The Fourth Wall’ on Metalheadz was exceptionally well received by press and fans alike, with award nominations and UK top 40 chart success following its release. At the end of 2014 the album regularly appeared within top 10 lists across all genres, a triumph for all concerned. As DJs Ulterior Motive have performed at festivals and clubs across the globe to rapturous audiences. As producers they’ve remixed notable artists, collaborated with the cream of Drum ‘n’ Bass producers and have been requested as sound designers for forthcoming projects in new media. As Metalheadz goes from strength to strength so do Ulterior Motive. There is a firm commitment to quality over quantity that continues to set the label and the duo apart from their peers. Lenzman dropped his hugely anticipated debut album 'Looking At The Stars' on Metalheadz in 2014. An ambitious project, with music reaching out to many of the genre's different reference points, the tracks showcased his influences from Hip Hop, Soul and beyond. The release of the album, critically acclaimed, led to an exceptionally busy tour schedule, with Lenzman performing at prestigious festivals and club nights worldwide.The success of the album also led to the ‘Looking At The Stars’ remix EP. For that project Lenzman selected six of his favorite artists to remix a track of their choice from his album. He also brought various remixes as well as new solo material. An artist who is never afraid to wear his musical heart on his sleeve, Lenzman continues to push his own unique brand of Drum ‘n’ Bass: soulful, deep and melancholic, yet fun: an essential ingredient for any good party! Having been sparring partners and close friends for over 15 years, Jubei & SP:MC are excited to present their new concept project ‘Zones’. The Zones concept brings the DJ & MC combination into a new light by professionally recording & presenting particular shows. And yes, Jubei & SP:MC’s set at Star Warz will be recorded for this very same project !Jubei and SP:MC started touring across the globe in 2015 and on certain dates the shows were recorded and released for free via the Zones website with custom artwork about three or four times per year. With both Jubei & SP:MC being leading names within the global Drum ‘n’ Bass community, the project quickly gained a significant following amongst fans & media outlets. And four artists in a row with huge albums on Metalheadz as also Mikal scored high with his ‘Wilderness’ album on Metalheadz. The Bristol based producer and DJ is known for his stand out tracks and sets with the kind of dark, uncompromising production and delivery reminiscent of early jungle. Mixmag have frequently championed his work, naming him 'a producer to watch.' He's already released an impressive back catalogue on Friction's SGN: LTD, Skream's Disfigured Dubz and Break's Symmetry. He is consistently featured in the Fabric Live CD series, mixes and Drum and Bass Arena compilations as well as remixing Cause4Concern's 'Never Acid Again' and 'Night Gasp.' Since signing to Metalheadz, Mikal has been included in their Genesis EP series, produced two singles and a killer five track EP, 'Immaterial' that became another Mixmag 'release of the month.' The 'Wilderness' album features many high calibre artists as Sophie Barker, Break, Chimpo, Xtrah and RIOT. Being the hosts of the infamous Major League events Pamb & Harsh have been one of the driving forces in Drum ‘n’ Bass in Holland for over 15 years. They are known for playing all styles that Drum ‘n’ Bass has to offer and always deliver a great performance. From Belgium, Star Warz also welcomes Split Personality, the duo behind the Halogen label. Next to numerous gigs all over the country, they also played at Outlook festival last year!